A new study of fossil fishes from Middle Triassic sediments on the shores of Lake Lugano provides new insights into the recovery of biodiversity following the great mass extinction event at the Permian-Triassic boundary 240 million years ago. The largest episode of mass extinction in the history of the Earth, which led to the demise of about 90% of marine organisms and a majority of terrestrial species, took place between the Late Permian and Early Triassic, around 240 million years ago. How long it took for biological communities to recover from such a catastrophic loss of biodiversity remains the subject of controversial debate among paleontologists. A new study of fossil fishes from Middle Triassic strata on the shores of Lake Lugano throws new light on the issue. 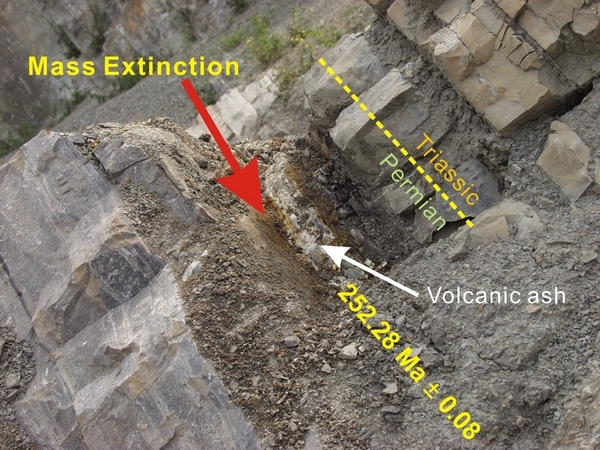 The study, undertaken by researchers led by Dr. Adriana López-Arbarello, who is a member of the GeoBiocenter at Ludwig-Maximilians-Universitaet (LMU) in Munich and the Bavarian State Collection for Paleontology and Geology, suggests that the process of recovery was well underway within a few million years. The authors, including Dr. Heinz Furrer of Zurich University and Dr. Rudolf Stockar of the Museo Cantonale di Storia Naturale in Lugano, who led the excavations at the sites, and Dr. Toni Bürgin of the Naturmuseum St. Gallen report their findings in the journal PeerJ. The fossil fishes analyzed by López-Arbarello and her colleagues originate from Monte San Giorgio in the canton Ticino in Switzerland, which is one of the most important sources of marine fossils from the Middle Triassic in the world. The Monte San Giorgio rises to an altitude of 1000 m on the promontory that separates the southern arms of Lake Lugano in the Southern Swiss Alps. But in the Middle Triassic, it was part of a shallow basin dotted with islands fringed by lagoons, which were separated by reefs from the open sea. “The particular significance of its fossil fauna lies in the careful stratigraphic work that has accompanied the excavations here. The positions of each of the fossil finds discovered here have been documented to the centimeter,” says Adriana López-Arbarello. On the basis of detailed anatomical studies of new material and a taxonomic re-evaluation of previously known specimens from the locality, she and her colleagues have identified a new genus of fossil neopterygians, which they name Ticinolepis. The Neopterygii include the teleost fishes, which account for more than half of all extant vertebrate species. However, the new fossil species are assigned to the second major group of neopterygians, the Holostei, of which only a handful of species survives today. The researchers assign two new fossil species to the genus Ticinolepis, namely T. longaeva and T. crassidens, which occur in different sedimentary beds within the so-called Besano Formation on Monte San Giorgio. The two species coexisted side by side but they occupied distinct ecological niches. T. crassidens fed on mollusks and was equipped with jaws and teeth that could handle their hard calcareous shells. T. longaeva was more of a generalist, and was found in waters in which T. crassidens could not survive. The authors interpret the different distribution patterns as a reflection of changing environmental conditions following the preceding mass extinction event. The less specialized T. longaeva was able to exploit a broader range of food items, and could thus adapt more flexibly to fluctuating conditions. On the other hand, the dietary differentiation between the two species indicates that a variety of well-established ecosystems was available in the Besano Formation at this time. “This in turn suggests that the marine biota is likely to have recovered from the great mass extinction relatively quickly,” Adriana López-Arbarello concludes.